This site is dedicated toward the promotion of the Illinois Capitol Building and is intended to serve as an informational and educational resource for its visitors. Its creators have worked in the Capitol for a combined 40 years and are interested in the history of the building and efforts to preserve it for future generations. We hope you enjoy your on-line journey through the halls of one of the great state Capitols in the United States of America. The creators of this website have co-authored a book about the Illinois Statehouse showcasing many never-before published photos of the Capitol. 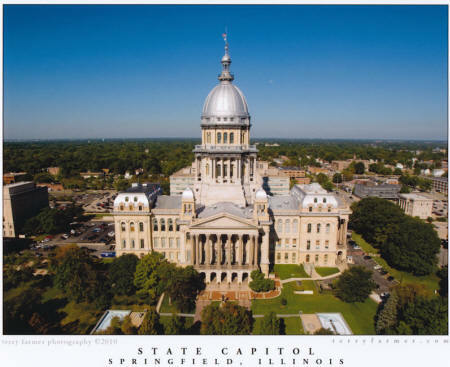 The Illinois Statehouse is available at several Springfield locations, among which are those that have kindly hosted book signings for us over the last several months. We would like to express our sincere gratitude to the staff at the following Springfield locations: The Dana-Thomas House, Prairie Archives, The Illinois State Historical Society, Sam's Club, The Abraham Lincoln Presidential Library and Museum, Barnes and Noble Booksellers & the Lincoln Home Visitor's Center. We have been honored to be at each site. Many thanks also to those who purchased books, or just stopped by to share a story or discuss the Statehouse.